9 September 2017 – Photographer WINS the monkey ‘selfie’ lawsuit. David Slater, the photographer whose camera was used to take the photos of the crested macaques in Indonesia has agreed to donate 25% of any revenue and he will keep all of the remaining 75% revenue. 8 August 2017 – ‘Monkey selfie’ case nears conclusion… The copyright infringement case brought by PETA on behalf of a monkey is nearing its conclusion after a joint motion to stay the appeal was filed. It stated that the “parties have agreed on a general framework for a settlement subject to the negotiation and resolution of specific terms”. 28 July 2016 – PETA has filed an appeal to the United States Court of Appeals for the Ninth Circuit. 18 February 2016 – The district court dismissed the complaint with prejudice for lack of standing under the Copyright Act and entered judgment. In 2011 a wildlife photographer David J. Slater had left his camera unattended in an Indonesian forest. 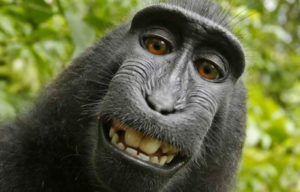 A crested macaque (monkey) called Naruto, snapped some pictures of himself and the photographer later published them. PETA sued the photographer for infringement on Naruto’s copyright as the author of the photos. David and his company, Wildlife Personalities Ltd., both claim copyright ownership of the photographs. PETA argues that Naruto the monkey is the ‘author’ of the works and that nothing in the Copyright Act limits its application to human authors. If this lawsuit succeeds, it will be the first time that a nonhuman animal has been declared the owner of property rather than a piece of property himself or herself. It will also be the first time that a right has been extended to a nonhuman animal beyond just the basic necessities of food, shelter, water, and veterinary care. PETA is seeking the court’s permission to administer and protect Naruto’s copyright in the “monkey selfies,” without compensation, with all proceeds to be used for the benefit of Naruto and his community.